This is an article as well as an invitation to an upcoming Webinar on the same subject. This is not to imply that ALL Virgo women are doing well. First I will say, that without a doubt, the most numerous sign/gender combinations that I address as clients are Virgo females. Followed by Aquarian women. I’ll explain later. You have to start by getting an idea of what Virgo the Virgin is about, and what it is not about. Once I finished writing the Virgo chapter in “The Exquisite Zodiac”, I started over again. I had had my fill of all the books referring to Virgo as the “perfectionists.” In my gut, I knew there was more, much more. And, I knew that it needed to be dug into much deeper. This is why, after great amounts of research, the two new keywords I came up with for that archetypal sixth sign were “caring” and “pure”. Almost all Virgoans have pure complexions, even into their senior years. 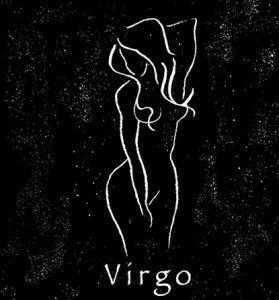 This is because Virgos have a direct, strong connection to pure GODDESS energy. I really believe that. Then, why do so many Virgo females get chart readings? And, what about the males? First of all, the males are embarrassed by emotion and try to supplant it with hard work and being productive. Emotions are messy things and most Virgo men have a very hard time with feelings. Nice guys, do anything for you, but don’t cry on their shoulders. They are not made for that. Now, when it comes to the women, what has been happening the past few years is that transiting Neptune (spirit) has been slowly making its way through the sign of Pisces, the sign opposite Virgo. Pisces is the complete opposite energy from Virgo. Virgo, separate, compartmentalize and analyze. Pisces, include, be non-discriminate and accepting. No two signs of the zodiac are farther apart in archetypal meaning. Well, since Neptune has been powerfully affecting Virgos, it’s been bringing out their spiritual side more for the past 7 years or so. Virgo, by definition is a very caring sign which is why so many with this heavy “do what’s right and care” energy end up as nurses. This is the main reason that the original title of my book, “The Exquisite Zodiac” was to be: “Pisces: The Ultimate Sign”. But, I deferred because I thought it could have been misleading and people might think that I thought it was the best sign. Not. And, it’s just not true. Most Virgos don’t know how to relax. After Neptune has been around, they have been doing much better. Yes, they feel better when they are productive, but that’s not the point. We each need a sense of purpose (or so we think.) What we actually need is a growing sense of being. The main power of this Virginal sign is “to fix”, Virgos are fixers. And, they’re good at it too. Well, since they are reverent and appreciate what Goddess has given them, what does that say if they always find something wrong with everything? Now, you see the conundrum. The trick is to stay after work, not complaining and get whatever needs done done, but not because it is broken. Virgos need to fix because that is what they do – not because what they have been given is imperfect. That is the illusion of this sign. And, it’s quite convenient for their male counterpart. Males always have an excuse as to why they need to stay longer at the construction site, in the garage or fixing whatever they think needs it. It’s a way to avoid self and emotion in many, many cases. You cannot fix yourself; you can be one way or another. You are not a machine. So, in the many years I’ve studied and worked with this sign, I’ve never seen anything like this recently. Virgo women (not all) or those with strong amounts of Virgo in their charts are starting to relax, to give themselves a break and thusly are becoming less robotic. Yes, you heard me, less robotic. That’s what you become when you always do what you SHOULD do. Well, thank Goddess, Virgo is now getting it: Do what you feel you should but align it with what you want to do (God’s will). The two are lining up. They’re becoming more natural and there is no sign that appreciate aligning with nature more. All Virgos come to me to ascertain “what their life direction should be”, another way of doing what they should. 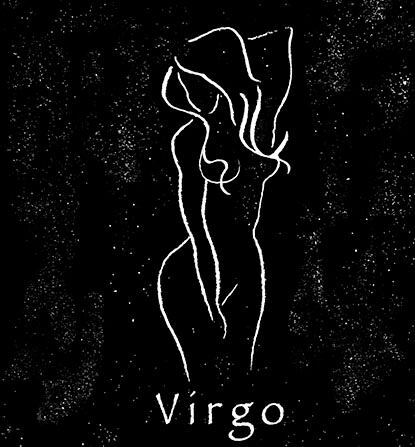 Virgo is a much underrated sign – due to that’s how they like it, flying under the radar. Their time has come. Now they fix because that’s what they do. They are a beautiful, caring sign and are becoming more real, i.e., more in touch with what they want to do instead of doing what they “should” do which is nothing but another value judgement, eh? Just like “deserve”, “rights”, etc. There are no rules anywhere. There is no right or wrong anywhere either. Too much freedom makes us uncomfortable. We really aren’t that able to handle the unbounded blue skies. But, we’re all getting better at it. That’s what the Old Testament and Koran were all about: RULES. DON’T BREAK THE RULES! But, now, we’re becoming much more enlightened (some are mistakenly calling it politically correct). We’re getting it. This article and coming workshop are intended for everyone because we all have bits and pieces of this archetypal pattern in us. As we become more in touch with the singular, beautiful, all-knowing Oneness inside, we will naturally do what is “right”, will know how to fix things, will not waste time, will know how to treat each other, etc. Why? Because it is in our celestial nature – not shoved down our throats by some oppressive church or government or highly distorted book of the ages filled with fear and warnings and burnt offerings. In a lot of ways, the liberation that is happening to Virgo is affecting all of us. You know exactly what I mean and what I have been saying: it is the end of the Age of Mea Culpa.